Dolly Varden fishing on the Kenai River is often off the hook in the spring until the middle of september. This beautiful fish was caught in the fall right before the Dolly mVarden spawn. Dolly Varden are in the char family and spawn in the fall. When you find spawning Sockeye Salmon you’ll be sure to find a Dolly Varden or two behind them. With clearer water look for the shadows under and behind the salmon. They can be hard to see sometimes but whenever you approach the stream or river make sure you spend a minute looking before walking right up to the water. This fish was caught in the middle of September on the Kenai river and is a very good fish. Large 25 inch or bigger Dolly Varden are caught daily on the kenai river when the bite is going off. 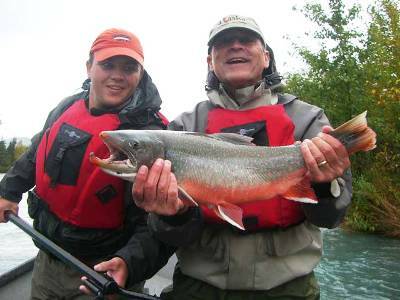 Guided Dolly Varden fishing on the Kenai River is easily booked with Drifting on the Fly. Give us a call or email us here and we will get you hooked up on a fishing trip of a lifetime.